U.S. Cellular highlights, in a new ad, that if you switch you get $600 off latest smartphones, with no trade-in required. 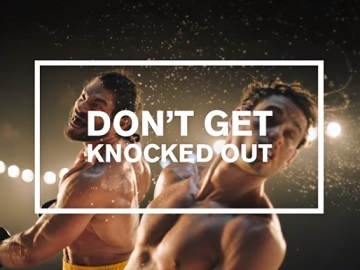 The 30-second spot features a boxer in the ring who, after being knocked out by a bad deal, which included activation fees he did not expect, is knocked out by his opponent, as well. “Don’t get knocked out,” the voiceover says, urging then viewers to switch to U.S. Cellular and get $600 off latest smartphones, no trade-in required, plus national coverage in the Middle of Nowhere. The company also informs that the deal requires Total Plan with Unlimited Plus Data, new line, port-in, credit approval, Device Protection+, qualified Smartphone purchase on a 30-month, 0% APR RIC and comes via a $20 monthly bill credit. Taxes, fees, and additional restrictions apply. Among the smartphones available for purchase are Samsung Galaxy Note 9, Galaxy S9 and S9+, iPhone X, LG V40 ThinQ, iPhone XS Max, XS, and XR, and others.